Optical Distribution Frame (ODF) is integrated components in any fiber management system to handle termination and cross-connection of cables. Pre-terminated ODFs with cables are pre-installed with connectors and cable for quick and easy installation. Units with pre-terminated cables offer advantages such as faster installation, resulting in shorter time to revenue as well as guaranteed quality and performance. We offer optical distribution frame in different size, such as 1U 12 ports, 1U 24 ports, 2U 36ports, 3U 48 ports, 4U 72 ports. Several cable options are available. An Optical distribution frame also is a fiber optic management unit which is used to organize the fiber optic cable connections. They are mainly used as the interface between optical transmision network, optical transmission equipment and between optical cables in access network of optical fiber subscribers. 1. 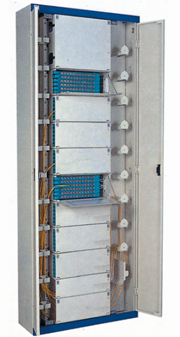 Fully enclosed standard frame with a maximum capacity of 576 cores. 5. Cables and fibers can be inlet from the top and the bottom of the frame through separate entrances. Cable (fiber) entrances are protected by cable-protected ribbon and contain enough space for fiber passing. 6. Made of top quality steel and treated with galvanizing, oxidation and electrostatic plastic spraying. 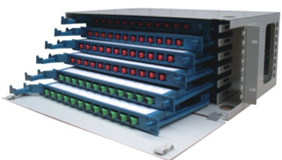 Optic Distribution Frame is suitable for large capacity wiring requirement, such as FTTX local or branch point, can be configured with optic splitter modules, easy to achieve optic splitting. SOPTO can provide for 1U/2U/3U/4U/6U ODF Units for Optical Distribution Frame. If you want to know more about the exact information of the ODF, please contact us.